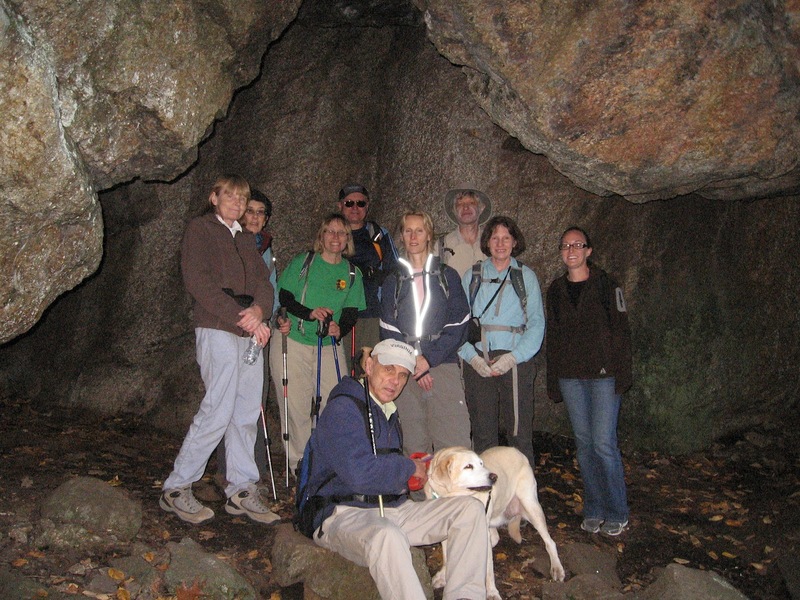 This has always been a popular hike for club members, but weather has conspired against us for the past couple of years. Thus it was with relief to show up at Albemarle High School on Saturday morning with near perfect conditions forecast for the day. 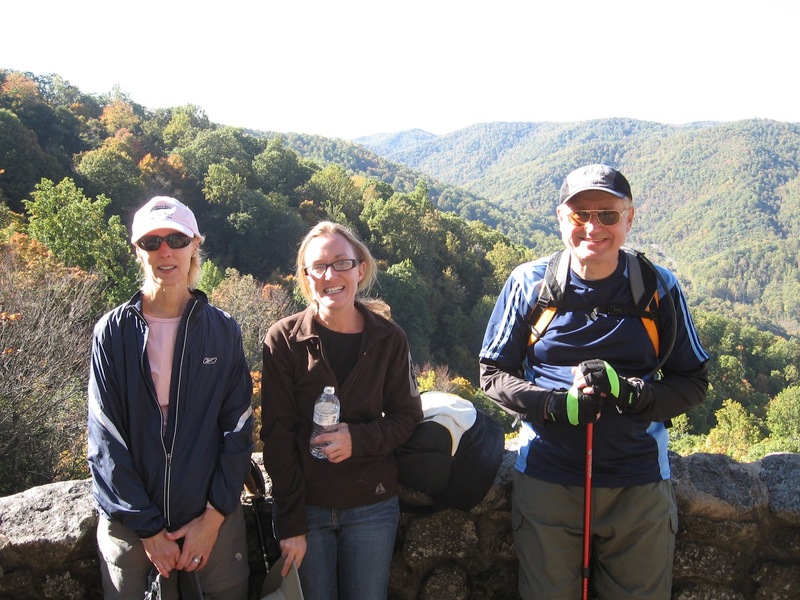 Hike leader Ken Moss met six other hikers and quickly organized the carpool for the long ride to the Mount Pleasant Scenic Area of George Washington National Forest in Amherst County. Upon reaching the upper heights of the Blue Ridge on Route 60 just west of Long Mountain Wayside, we turned right onto Coffeytown Road and pulled over to await a planned link-up with Bill Holman, who had dropped off Iva Gillet, Dan Ralston and John Brandt at the Montebello Fish Hatchery for a 12-mile hike along the Appalachian Trail to Hog Camp Gap. Bill wasn't there at the appointed hour, so we waited while listening to the excitement of an adjacent auction which had brought many people and cars to this normally isolated spot. Alas, no Bill after a half hour wait, and with no cell service we decided to proceed. While driving the dirt road to Hog Camp Gap, Ken finally got enough of a cellular signal to allow a text message from Bill to pop up on his phone (it was Bill saying he was late and not to wait for him), so he stopped to tell the trailing cars of Bill's status...but upon exiting his car, he was surprised to see Bill at the rear of the convoy, waiving! The group was finally whole and we proceeded to the trailhead without further incident. We soon started our walk along the Old Hotel Trail, taking us through easy grades in former orchards and farmland. After about a mile we came to the famous open camp area along the trail under a huge old oak tree, where we discovered that overnight campers had failed to completely put out their campfire. With abundant dried dried leaves about and breezy conditions, Brad Young and Rita Kieffer got to work trying to extinguish the smoldering embers with what was at hand...finally deciding with Ken that burying the smoldering coals would be the only possibility. Having done our good deed for the day, the group continued up the trail. Lunch time arrived at the same time as we did at Cow Camp Gap Shelter, which boasted a large picnic table and even an outhouse. A pleasant meal followed, with the conversation wandering, as often happens, to oddball topics that caused many chuckles...including some of the men, including Brian Muszynski (who was supposed to be with Iva's group, but had arrived too late after stopping at Bodo's Bagles while riding his bike to AHS! ), Bill and Ken getting in touch with their feminine side! Bill also managed to perk everyone up with his customary offering of chocolate, which just added more fuel to the fire concerning the feminine side discussions! We were soon back on the trail, climbing toward the ridgeline, crossing at least one shallow stream which still allowed for Leon Gorman's best friend, Bailey, to enjoy a brief moment splashing around. 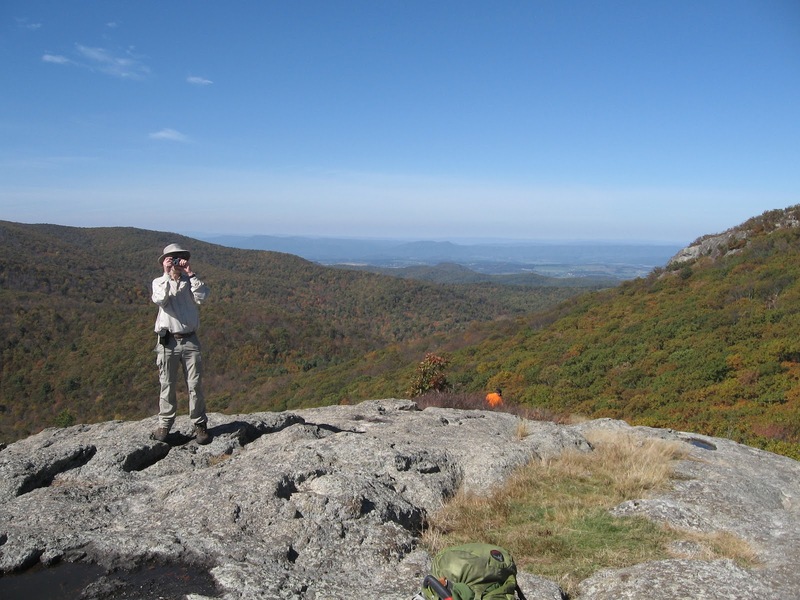 Soon we intersected the AT and headed north, climbing steadily and passing a couple of nice rock outcroppings which allowed fine views to the west. The autumn colors were in full display, if perhaps a bit subdued...there is a predominance of oaks in the area, so not as vibrant as we may have wished. After identifying some terrain features far to the west thanks to the clear conditions (such as Interstate 64 west of Lexington and even the VMI campus), we finished the last section before reaching the wide open summit of Cold (Cole) Mountain. The summit here is special, as it is a rare maintained bald (obviously mowed) in a region famous for tree covered mountains. On previous hikes, due to the unobstructed panorama and it's resemblance to the opening scene from The Sound of Music, club members Debra Fisher and Marian Styles have led the group in the singing of that movie's theme song, The Hills Are Alive...but last minute obligations apparently kept them away from this trip, even as several hikers regretted their absence and made modest attempts to sing both the theme song as well as Do-Re-Mi. Joanne Davis marveled at the location, knowing of what she spoke considering that she lived in Switzerland for many years before recently moving to Crozet. 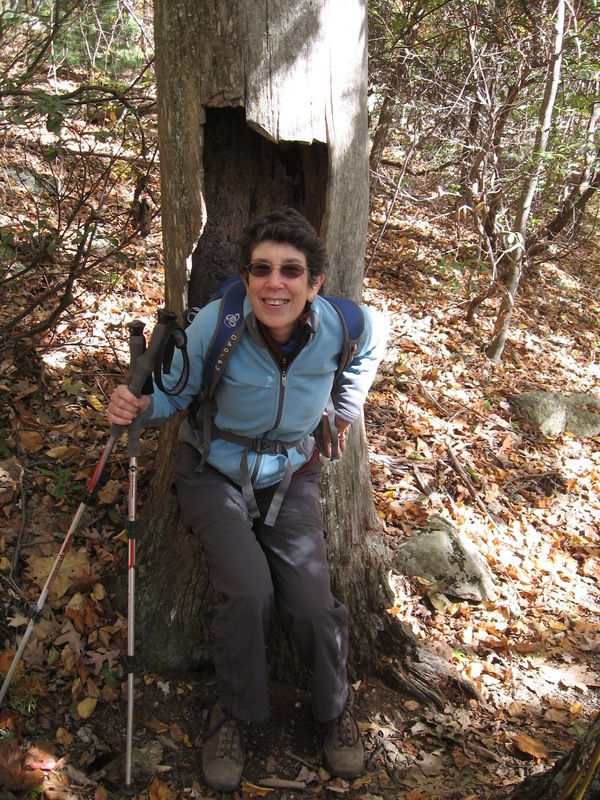 Liz Lyons recalled memories of her first trip to the summit. After absorbing the views and taking lots of photos, the group continued along the open ridgeline, basking in the sunshine and enjoying the expansive views as we walked. We soon reentered the wood-line and descended the AT to Hog Camp Gap for a short walk down the road to our cars. With the hike over, it was time for phase two of the day's activities...a stop at Wild Wolf Brewery in Nellysford. for refreshments and a planned link-up with Iva's group. With such a beautiful fall day, all of the brewerys along Rte-151 were busy and we had to wait awhile for a table and finally confiscated one just as our waitress arrived to take our orders. Most people decided to do dinner, and Iva's arrival with Dan and John briefly completed the circle before people began to drift off to the four corners of the world. A hardy nucleus remained until the sun and temperature dropped enough to cause us to look forward to car heaters for the drive home...but, as always, socializing with friends was a wonderful way to end a day on the trail. 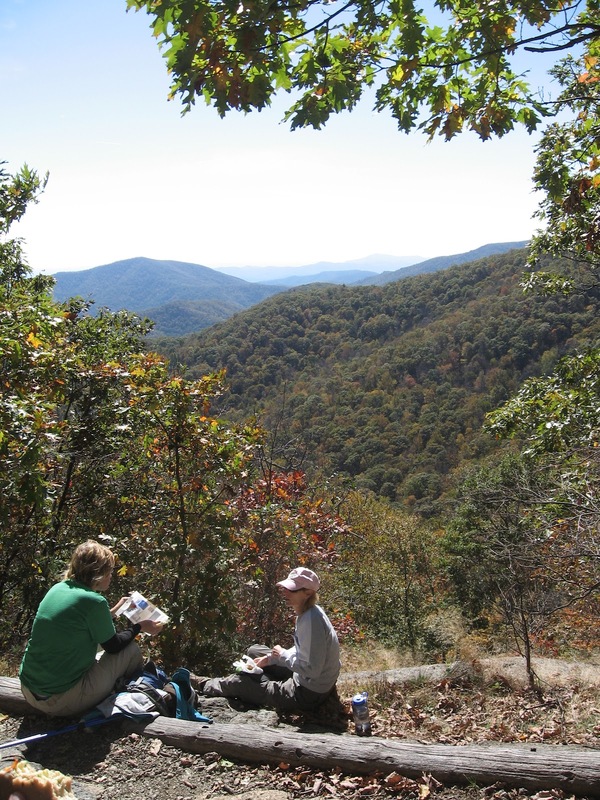 PATC - Charlottesville Chapter was invited to participate in this year's Crozet Trails Day by the Crozet Trails Crew. The format was a bit different from earlier events due to a planned tree planting at Claudius Crozet Park, meaning a separation from the bigger crowds at Old Trail for the 5k race. Nevertheless, Maynard Davis, Liz Lyons and Ken Moss carried the flag for PATC and discussed the contributions for the public good made by PATC members as well as the benefits of membership. Despite a smaller than planned crowd, the Charlottesville Chapter representatives enjoyed watching a tree planting demonstration and talking with other participants and attendees...while managing to sign up two new members! It was a beautiful day and the view of the Blue Ridge from Crozet was simply beautiful. This lovely fall day attracted several hikers we haven’t seen in awhile—Kelly Darby, Karen Ramsey, Anne Colgate, and Dennis Templeton. Rounding out the group were Leon Gorman & Bailey, Neal McKinney, Kelly Gueli, Briana Taylor, hike leader John Shannon, and reporter/photographer Marian Styles. Leon, Bailey, and Karen parked at Crabtree Falls and walked to the top to eventually meet the rest of us, who started from the Montebello Fish Hatchery. The eight who started from the fish hatchery walked up a long, rather steep grade to reach Spy Rock. Our payoff was a spectacular view. We tarried a bit to enjoy the scenery and have a pre-lunch snack. Another viewpoint a bit further on served as a lunch venue. John made even the most boring lunch yummy by passing around pumpkin cake. 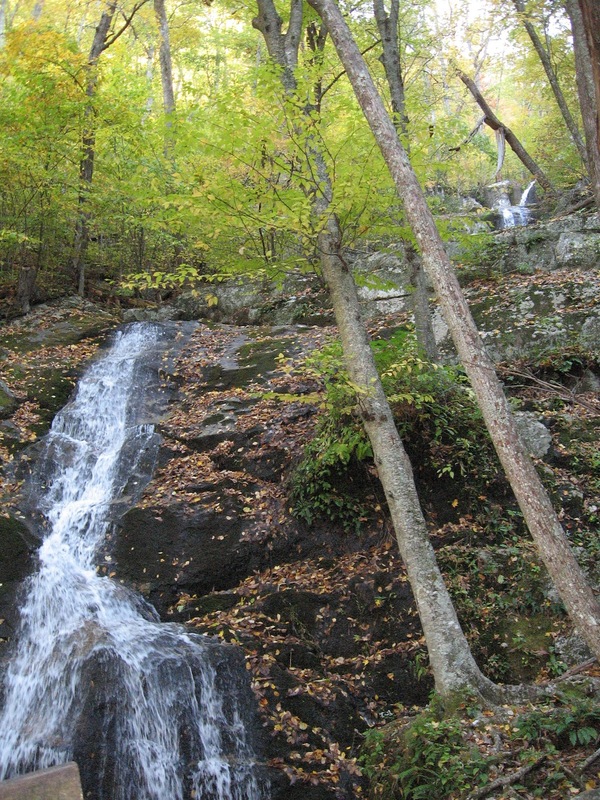 The trail to Crabtree Falls thankfully offered easier hiking. The walk was spiced up when Anne noticed a small snake in the trail (where is snake whisperer Rita when you need her?). 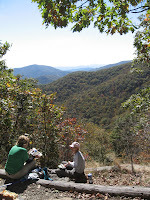 Meanwhile, at the top of Crabtree Falls, Leon, Bailey, and Karen had enjoyed a prolonged picnic while waiting for us, and we all headed down together. The first major viewpoint was more crowded than I’ve ever seen it—people had come out in droves on this gorgeous fall day. As for fall colors, we didn’t see many. A lot of leaves have fallen from the trees, and many other trees were still wearing green garb. We glimpsed a smattering of color here and there, and the falls are lovely in every season. We finished hiking by about 4:30 p.m., after which Leon graciously drove the two drivers back to the fish hatchery to fetch their cars. By the time the car shuttle was done, most people wanted to get home, so we skipped stopping at Rapunzel’s and got back to town at 6:30 p.m. This weekend, Dan and Motoko Vining visited the area to see their properties at Vining Tract, with its several cabins, and Dunlodge in Charlottesville. Freed from his job, overseer Don Davis showed up to tend to some items. John Shannon, recovering from travel, stayed close to home and destroyed some exotic invasive plants, less than a week after doing the same the other side of the world. The Vinings got a look at the new electric meter and the paint that they paid for, as well as the location of new and repaired drainage lines that they also paid for. Dan and Motoko greatly appreciated the efforts of the volunteers who prepped and painted the Dunlodge, and they thought that the house looked better than it has for a long time. This was another day where the group converged, more or less, from different directions. Andy Willgruber met Rita Kieffer and John Brandt at Albemarle High School and drove this small nucleus to Exit 240 on I-81, where they met up with hike leader Ken Moss. We had all been keeping our eyes on the weather forecast for the day, which had increasingly threatened rain showers as the day progressed. Driving west we couldn't help but notice ominous dark skies hovering over West Virginia. From Mt. Crawford everyone transferred to Ken's car (leaving Andy's in a Burger King parking lot) for the drive to the trailhead on Briery Branch Road in George Washington National Forest. 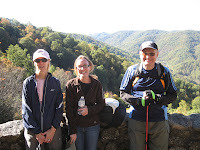 After waiting awhile for a planned link-up with Iva Gillet and Bill Holman, who were camping in nearby Sugar Grove, WV, the group decided there must have been a change in plans and elected to forge ahead up the trail. We began by strolling down California Road and crossing Briery Branch before reaching the junction with the Lynn Trail near a hunting camp. This trail took us on a steady uphill climb of almost 2 miles before making a right turn on the Wolf Ridge Trail. This short section continued the climb, with a fairly steep portion included before finally reaching the Timber Ridge Trail, where things leveled out nicely for a pleasant ridgeline walk for almost three miles, stopping for lunch in the sunshine which had broken out as midday progressed. We eventually emerged from the Timber Ridge Trail onto the paved Forest Service Road 85, which looped us quickly up to the summit of Reddish Knob (4,397 ft. altitude) on the Virginia - West Virginia state line. 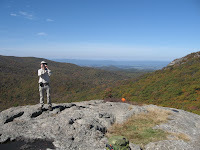 From here we enjoyed expansive views into both West Virginia and east toward the Shenandoah Valley. The weather had continued to improve, with partly cloudy skies and dry, cool air causing us to add a layer for warmth. An added treat was the beautiful display of Fall colors at this higher altitude...it seemed that the colors are coming early this year. After taking in the glorious panoramas at the summit, we began the descent down the paved road towards the car parked 6.5 miles away...but just as we approached the upper Timber Ridge Trailhead, who should emerge onto the road but Iva and Bill, who had just completed their ascent from where our car was parked! They had arrived late at the trailhead... but only about 10 minutes after we had left! We all enjoyed the happy impromptu reunion, describing our exploits of the morning. Then they suggested that they could shuttle us back down the road to our car, since they had Bill's SUV parked at the summit (a friend from Sugar Grove had dropped them at the trailhead). After some debate of the merits of walking 6 miles on a paved road versus a shuttle ride, we determined to at least begin the descent on foot and then hitch a ride with Iva and Bill during their descent...so we began the walk, taking in the more scenic stretches of the road before being picked up by Bill and Iva for the ride back to Ken's car. We had been discussing all day what to do for après-hike activities on our return drive home, but Bill said that he was going to check on a geocache he has on nearby Bother Knob, so we decided that with our time savings thanks to the shuttle that we could make that excursion, which sounded interesting. The weather by then was absolutely beautiful, without a cloud in the sky, so we weren't too eager to leave the mountains. We caught up with and followed Bill's SUV up a rough dirt (and at times muddy) road...Ken was sure his Subaru was smiling as we bounced along the road! After a couple of miles we all parked and continued on foot for the last mile, ending with a final bushwhack to the summit of Bother Knob. 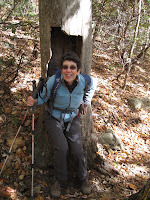 Iva took charge of Bill's GPS and masterfully found the geocache without a misstep. We then headed back to our cars and parted company with Bill and Iva, who returned to Sugar Grove. The rest of the group returned to Mt. Crawford to retrieve Andy's car and then proceeded to Staunton, where we had dinner at Texas Steakhouse in celebration of Ken's birthday the previous day. With the shuttle ride and excursion to Bother Knob, we did about 9 miles on foot...considerably less than the 12 miles planned, but nobody was complaining! It was a great day to be out and everyone enjoyed the views and companionship. It was a beautiful early fall day as a small group of PATC faithful gathered at the Harry F. Byrd Visitor Center at Big Meadows in Shenandoah National Park. First-timer Katharine Maus joined Iva Gillet, Bill Holman, Marian Styles and Ken Moss for a National Park Service event in support of National Public Lands Day. The group first took a short tour through the historical displays in the Visitor Center, guided by Ken who volunteers their on alternating Fridays. Following the tour, Park Rangers Cindy Blugerman and Abby Hydik gave a short presentation on the work plan to a total of about 40 volunteers (including our PATC group), which would be to remove a native invasive plant, black locust, with loppers and hand saws. 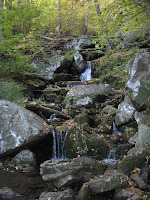 We walked across the Meadow to the northeast corner along the Rapidan Fire Road, where equipment was distributed to all. We then trooped through a small stand of trees to where we would begin to remove the black locust, a fast growing, woody, thorny bush of from 3 to 6 feet in height. Bill and Ken spent much time cutting bushes and fussing with dull loppers, while Marian, Iva and Katharine gathered the thorny cut brush and moved it off of the meadow. The process involved cutting a bush close to the ground and marking the spot with a small flag, so that a follow-on Park Service crew with herbicide could spray the remaining stump to try to prevent regrowth. The work was not particularly hard, and with so many workers we soon cleared the initial area we were assigned, so we then moved to another area further south until noon. That marked the end of the work day. We then rewarded ourselves with a nice lunch at the Big Meadows Lodge...a fitting end to a day in which we all felt good to have done our part for such an iconic location.